In February Steak and Legs took a week long tropical vacation. 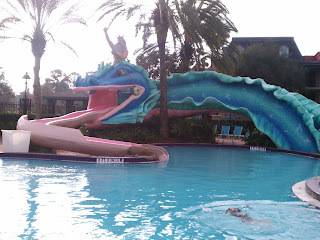 We traveled to Jacksonville, FL to run a half marathon with Legs' extended family, to Orlando, FL to visit Walt Disney World, and then boarded the Disney Dream cruise ship and traveled to Nassau, Bahamas and Castaway Cay. What follows is a picture diary of our trip. I've neglected to post the rest of our vacation pictures from our trip to Florida in February. So far I've recapped my extended family's reunion in Jacksonville on Friday, February 11th and Saturday, February 12th, our half marathon victory on Sunday, February 13th and our first two days in Disney World on Monday, February 14th and Tuesday, February 15th. On Wednesday, February 16th, Steak and I woke up in beautiful Walt Disney World Resort for our last full day of fun. We started the morning with a quick run from our resort, Port Orleans - Riverside, to its sister resort, Port Orleans - French Quarter. After our leisurely jog we got dressed and headed on the Disney bus to Disney Hollywood's Studio. I immediately took Steak over to see Lights, Motors, Action because he had never seen it before and I knew he would love it! We grabbed some lunch at ABC Commissary, rode on the Studio Backlot Tour and Toy Story Mania and then headed on the bus to Animal Kingdom. 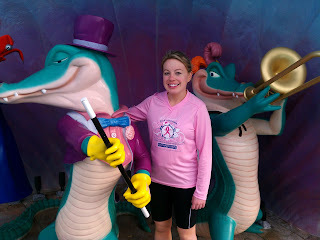 In Animal Kingdom we went on my favorite ride, Dinosaur, and then played some carnival games. Steak won me a basketball teddy bear shooting hoops and I won a little sea turtle at the mammoth derby racing. After the carnival games Steak rode Expedition Everest alone, because I'm too much of a chicken! Then we grabbed a bite to eat at the Yak and Yeti quick service station. I had the sweet and sour chicken. Steak had the honey chicken. While both were very good (surprisingly good for fast food standards) my sweet and sour chicken was definitely better. By this point in the night it looked like the weather was taking a turn for the worst, so we hightailed out of the park and headed back to our resort. When the bus stopped at our sister resort, French Quarter, first, we decided to get off and explore its lobby and gift shop and walk along the river back to our resort. After a quick tour of the grounds we retreated to our room to watch the Wednesday ABC comedies and head to bed.